For an engine to perform the way you want it to, there is an important fact to consider. Quality parts. The parts you use bring out the personality of the engine. Performance requires the selection of the right camshaft that influences the way the engine performs. There are several important facts to consider when designing engines to be suited for marine endurance. This comes down to static compression ratios to maintain cylinder pressure therefore making the engine responsive and achieving good torque levels throughout the entire RPM range. 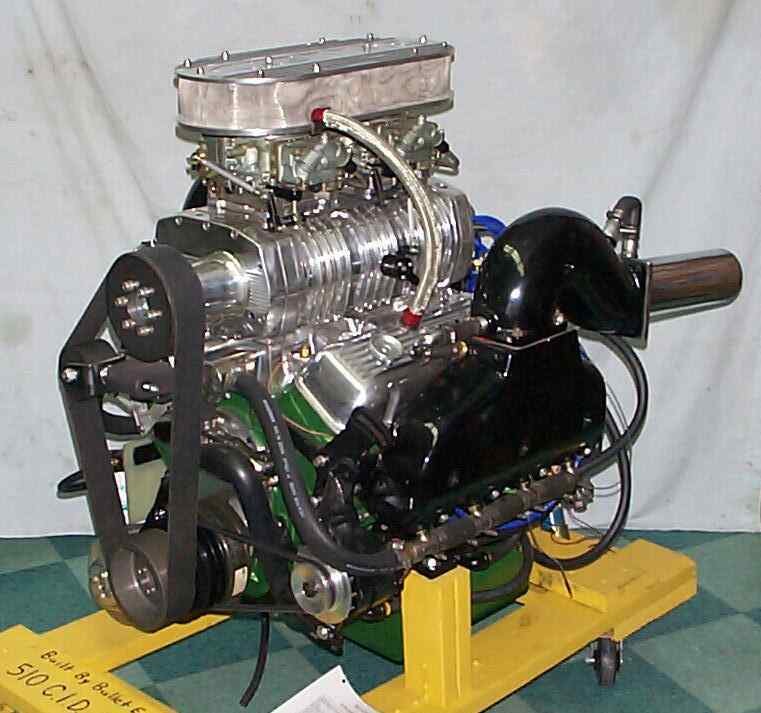 Your can expect nothing but the finest workmanship when all of our years of experience in building racing engines allow us to design combination that are best suited for pleasure performance boaters. Making reliability number one! The first step in creating a powerful engine combination is selecting the right camshaft. • Fast intake ramp for greater charge velocity. • Long exhaust ramp - preventing the valve from bouncing off the seat. • Increased seating for valve cooling and reduced valve train maintenance. Our camshafts come in hydraulic solids, hydraulic roller and solid roller profiles. Contact bullet engines for the proper custom ground camshaft which is best suited you’re your engine. The main principal for supercharging is “Keep it Simple”. Simply put, supercharging gives you more power for the dollar than any other induction concept. Supercharging forces fuel and air into the engine, increasing the combustion rate and intensity. Static compression ratio suited to your supercharged engine. Every pound of boost introduced by supercharging you get an additional 30 hp of power! Contact Bullet Engines for information on the right kit for you. Marine engines operate under load at all times, therefore they must be extremely reliable in the environment they run in. The following steps are taken to ensure your engine’s reliability. • Tuning carburetor and setting mixture adjustments and float levels. • Checking the engine for water, oil and fuel leaks. • Ignition timing and tuning the advance curve for total performance. • Leak down test on engine cylinders to ensure all piston rings, intake and exhaust valves are seating properly. An engine to perform the way you want it to it must be carefully thought out for the correct selection of parts to bring out the personality of the engine. The whole combination must be properly matched to ensure the engine is efficient and maintains power throughout the whole RPM range. Bullet Engines machines their own parts to ensure top-quality part and reliability. When designing a marine engine it is important that in the valve train department that careful steps must be made by using inconnel exhaust valves and race prepping the valve-train with 10 degree valve locks and titanium retainers. Competition performance valve jobs are performed on aspirated and supercharged engines to ensure proper valve seating, which helps the valve cool more equally. Cylinders are machined and finished in a 820 plateau finish. This is classified as micro-finishing bore. This way plasma molly piston rings will guarantee seating and reduced oil consumption. This is advantageous because it increases piston ring life. Extra clearances on connecting rods for increased oiling helps longevity for bearing life in high performance engines. Balancing and blueprinting of the entire engine helps longevity and smoothness of the reciprocating assembly. You can guarantee a Bullet Engine passes our testing it will far exceed your expectations!